Why do tourists go to Costa Rica? Well, the white-sanded beaches are certainly a draw, as well as the opportunity to zip line through a cloud forest, hunt for ghosts in one of the most haunted places in South America, or relax in a natural hot spring heated by active volcanos. Being perfectly honest though, we all know the real reason why people go to Costa Rica is to see those adorably happy sloths! What kind of sloths live in Costa Rica? 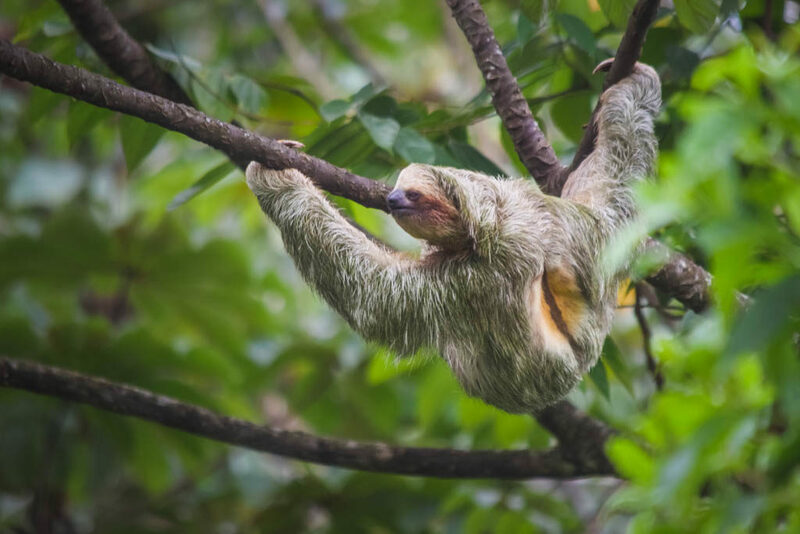 Of the 6 species of sloths, 2 are native to Costa Rica: the Hoffman’s two-toed sloth, and the Brown-throated sloth (a species of three-toed sloth). The two-toed sloths have 2 clawed toes (if you didn’t already determine this by the name) on their forefeet, and three toes on each of their hind feet. They have a longer snout and weigh in between 4.6 to 19 lbs. The Brown-throated sloth is more commonly seen in Costa Rica than the Two-toed sloth. They are smaller in size at around 5 to 13 lbs and have a small blunted nose. Our taxi driver spotted this guy on our way to the bus station. Both species of sloths live in dry forests, humid forests, riparian forests and old secondary forests. In other words, they are found pretty much anywhere in the country aside from big cities. Spotting sloths can be difficult for the untrained eye. As we walked through Arenal Volcano National Park and Prusia National Park in Cartago, Scott and I were determined to find a sloth in the wild. We walked at a snail’s pace, looking up toward the trees, and listening for rustling branches. Nothing. Our taxi was driving us toward the bus stop in La Fortuna and pulls over smiling and pointing toward the trees as he said “Perezosos”. 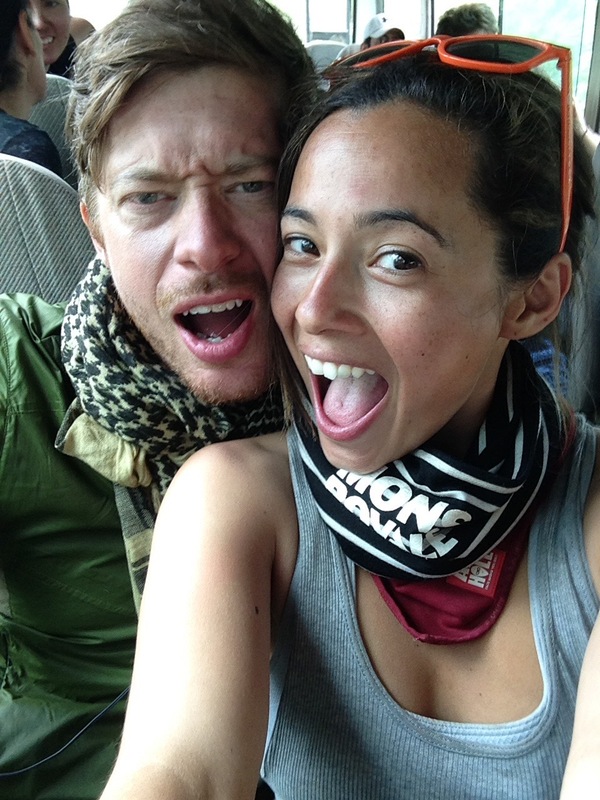 Within a 5-minute taxi ride, our local driver was able to spot a sloth! After we finished a safari by boat tour with Costa Rica Descents, we were driving back toward our hotel when our guide said “stop the car. There!” We pulled over and walked over 100 feet away to a group of trees where the guide pointed out a 2-toed sloth nursing its baby in a tree. How in the world they could spot these perfectly camouflaged animals so easily, I have no idea! A momma sloth and her baby. When searching for sloths in Costa Rica, there are several places you can look. However, if you want an up-close experience with these adorable little guys, there are a number of rescues and sanctuaries which specialize in the rehabilitation and release of sloths. We had the pleasure of visiting the furry inhabitants of the Toucan Rescue Ranch. 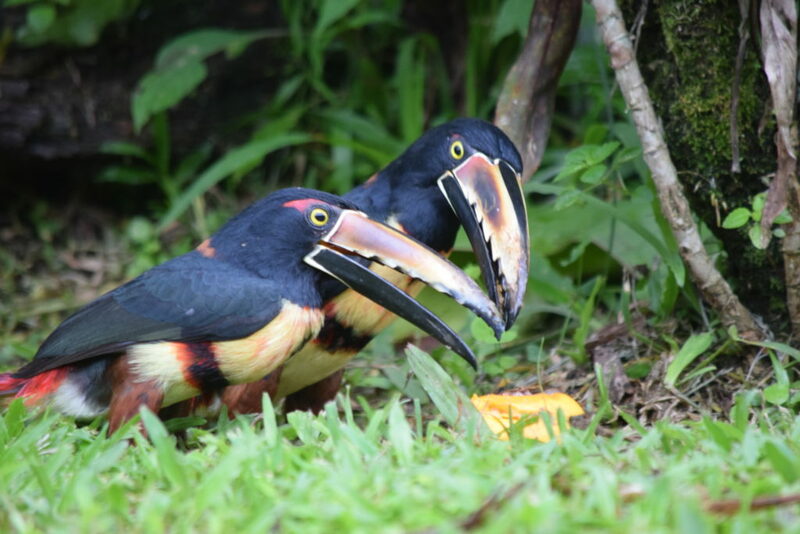 The Toucan Rescue Ranch focuses on the care, rehabilitation and study of Costa Rican toucans, sloths, and other wildlife. We toured the facility while our guide Pedro introduced us to the various species of sloths, and birds living in the sanctuary. Other resident animals include Spider Monkey Noelia, who was rescued from an abusive pet situation; Emma the neotropical river otter, who was separated from her mother; Gigi the weasel who was also separated from her mother; and Tabu the endangered Oncilla cat, who was poached out of the forest, sold as a pet and then later found roaming a neighborhood. There are a variety of tours available at the Toucan Rescue Ranch including an overnight option. Prices range from $35 per person to $60 per person (overnight option is more). Check out their website and see what option is most appealing to you. We took the Classic Ranch Tour which was informative and gave us a chance to meet all of the animals. The Classic Ranch Tour was both informative and amusing (Pedro is quite the comedian). In hindsight, we might have opted for the Specialty Sloth Tour to give us extra time with the young and adult sloths. 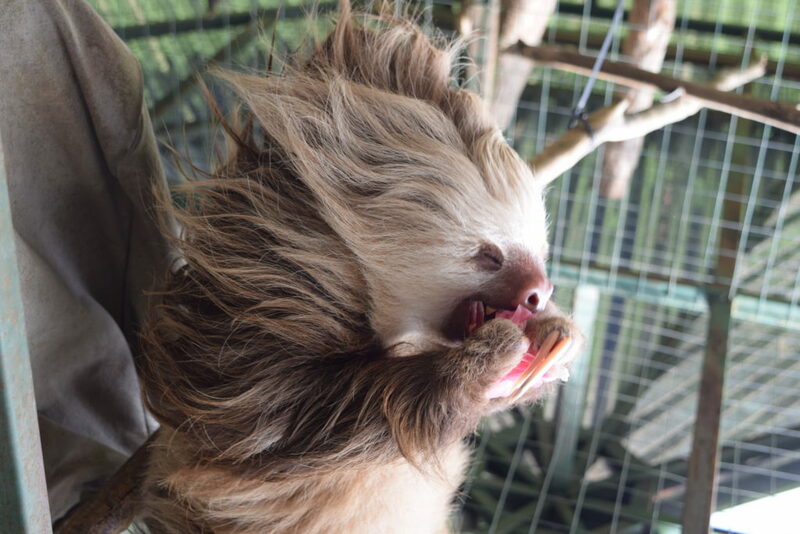 One of the resident sloths at Toucan Rescue Ranch. If you are planning to hold a baby sloth, you may be disappointed. 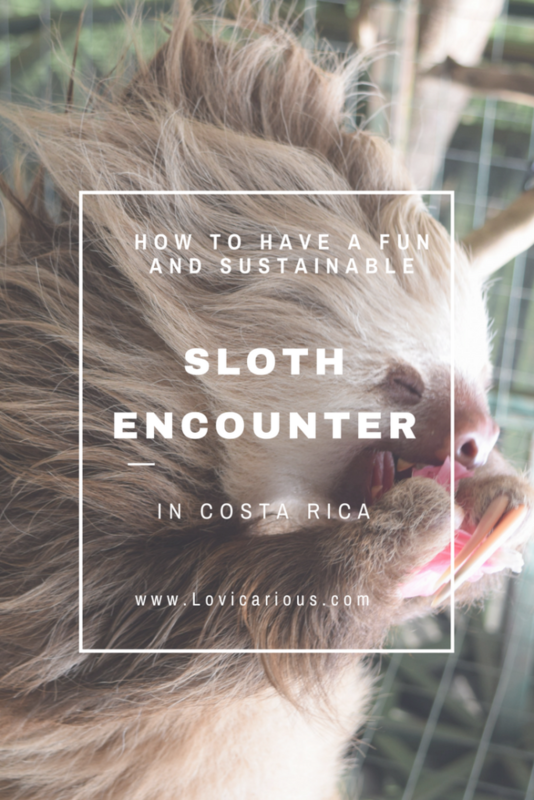 We went to Costa Rica hoping to cuddle one of these adorable creatures, however, we came to find that it is actually harmful to the sloth when it is held by human hands. This is for 2 main reasons: 1.) The fur of a sloth is actually a tiny little ecosystem of algae, fungi, mites, bacteria, etc. that work in a symbiotic way to camouflage the fur and make it unappetizing to predators. 2.) In rescues like the Toucan Rescue Ranch, the ultimate goal is to release the animals back into their natural habitat. Acclimation to human touch can threaten their ability to properly adapt when re-released into the wild. 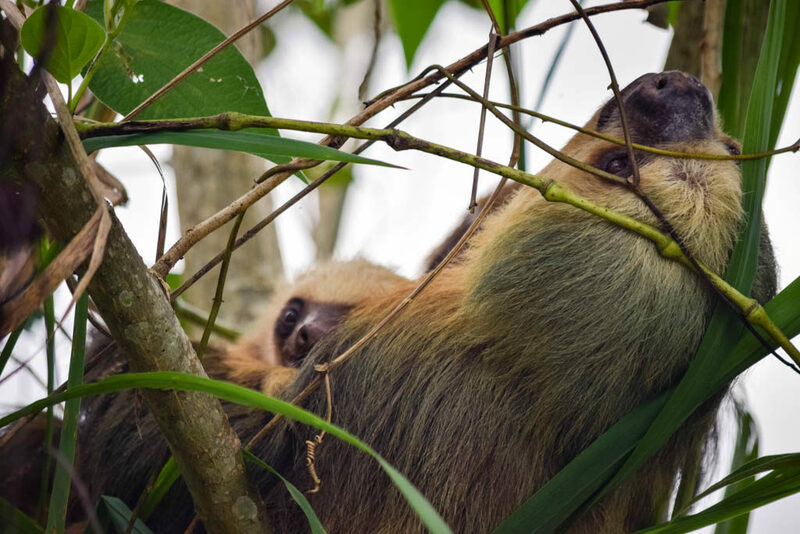 There are a few other centers in Costa Rica where you can visit sloths, however some may not be sustainable. Do your research and make sure that the center you are visiting (giving your money to) truly has the animals’ best interest in mind. Ahh how we wish we could have touched and cuddled those little guys. Glad to know that we were with a responsible sanctuary though that put the animals’ best interests first. It was an amazing experience. Well worth the trip to Costa Rica!